The Article: How California Is Debunking The GOP’s Obamacare Talking Points by Sy Mukherjee in ThinkProgress. The Text: On Thursday, California officials revealed insurance companies’ opening bids for the state’s Obamacare marketplace in 2014. The numbers are great for consumers — and terrible for right-wing fear mongering over the health law. Covered California, the agency tasked with constructing and maintaining the Golden State’s insurance marketplace, announced in a press release that rates submitted by 13 insurers for the 2014 individual marketplace were far lower than initially expected, ranging from a stunning 29 percent below the current average premium for small business health plans to only two percent above them. For Californians who will gain coverage in the marketplace, that means affordable health plans with a minimum base of ten “essential health benefits,” including prescription drug services, mental health care, and maternity services. And the announced rates are even better for consumers considering that they don’t take Obamacare’s federal insurance subsidies into account. Depending on income, the average middle-aged Californian would pay anywhere from $40 to $300 per month for a mid-level “Silver” health plan on the marketplace. Younger, healthier Americans looking to buy bare-bones “Bronze” health plans would end up paying less than $170 per month — or even nothing at all — if they make less money and receive federal Obamacare subsidies. That stands in stark contrast to heated GOP rhetoric and outlandish insurance company predictions about Obamacare. Last week, the Republican-led House of Representative voted to repeal the Affordable Care Act for the 37th time. During a House Energy and Commerce Committee hearing on Obamacare “rate shock” last week, House Republicans predicted hikes as high as 66 percent for Californians’ premiums based on internal documents from 17 major U.S. insurance companies. Such claims may make for good politicking — but as the California numbers underscore, they aren’t actually reflected in reality. During last week’s House hearing, Topher Spiro, Vice President for Health Policy at the Center for American Progress (CAP), warned against making hysterical claims about health insurance rates under Obamacare. He noted that independent analyses have shown that an influx of Americans into the insurance pool and marketplaces designed to foster competition would actually end up lowering Americans’ premiums, especially in high-population states like California. As it turns out, Spiro was right. Although some insurers have used Obamacare as an excuse to gouge profits, many have been actively working with doctors, hospitals, and regulators to offer Americans quality, affordable coverage at competitive rates. Plans on the California marketplace reduced their profit margins down to two or three percent. “It’s a revolutionary improvement to move from a broken market where people are charged by how sick they are, to a competitive market where people pay what they can afford, based on a percentage of their income, on a sliding scale,” Anthony Wright, executive director of the health advocacy group Health Access, told Reuters in an interview. And California isn’t the only state to release such positive initial numbers for its marketplace. Earlier this month, several Oregon insurers actually requested to lower their opening bids for the state’s insurance marketplace after they realized that their initial offerings weren’t competitive enough. Numbers for marketplaces in Washington and Vermont have also been encouraging. 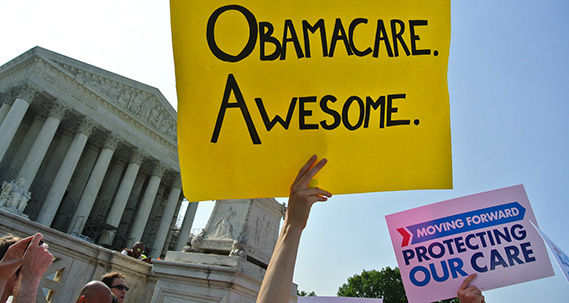 As more and more of Obamacare is implemented, the gulf between the political talking points about the law and its actual effects has become increasingly evident. With open enrollment for the marketplaces only five months away, the initial verdict on Obamacare is in: so far, so good.